The adsorption of Ciprofloxacin (CPX) from aqueous solution by Pomegranate peels (POP) was investigated in a batch process. The influence of time (5–60 min) and CPX concentration (100–10,000 mg/L) on the adsorption ability of POP was studied. The POP was characterized by FTIR, scanning electron microscopy (SEM), and Zeta sizer. The kinetic of adsorption was analyzed by the pseudo-first-order and the pseudo-second-order kinetic equations using non-linear regression analysis. As well as non-linear regression analysis of Langmuir and Freundlich models were applied to specify the best non-linear curves, fitted to experimental data and estimate isotherm parameters. In order to assess the best-fit kinetic model or adsorption isotherm, three error analysis methods were used to evaluate the result of adsorption process, namely the sum of the squares of the errors (SSE), residual root mean square error (RMSE), and chi-square (χ2). On the basis of low three error analysis and high correlation (R2) of determination, it can be concluded that both the non-linear form of pseudo-second-order kinetic model and non-linear form of Langmuir are best suited to explain the adsorption of CPX onto POP. The maximum adsorption capacity for pomegranate peel as calculated by non-linear Langmuir curve was much higher than in previous work (999 mg/g) at natural pH (4–5) and 25 °C. The high adsorption capacity of POP makes them very low-cost and effective adsorbent materials for CPX from aqueous solution. The appearance of pharmaceuticals in the environment has led to major health and environmental problems (Al-Heetimi et al. 2014). 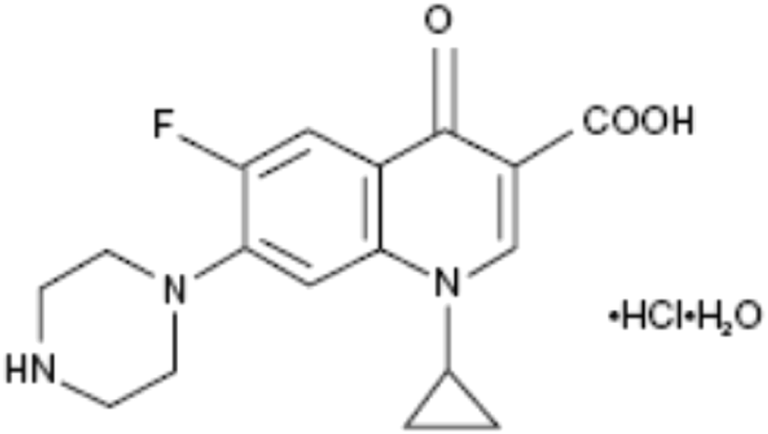 Ciprofloxacin (CPX) is a strong fluoroquinolone antibiotics used for inhibition of several bacterial infections. A residual amount of CPX was observed in the effluents of hospital (up to150 1 μg/L) and drug manufacturing plants (31 mg/L) (El-Shafey et al. 2012; Fick et al. 2009) and can reach surface water or groundwater causing pollution. 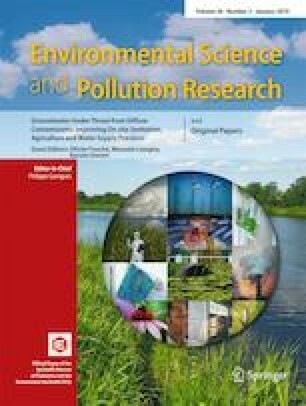 Study shows that the low concentration of CPX in wastewater and surface water is an environmental hazard as it can lead to bacterial antibiotic resistance (Rakshit et al. 2013). In addition, CPX can cause disturbance to the biological balance in the ecosystem. In consciences, it drives several studies for the removal of CPX from water. In the past decades, they were eliminating the CPX from the solution by biodegradation, chemical oxidation, and adsorption process (Genç and Dogan 2015; Sun et al. 2016). One of the easiest, most functional, and cost effective process used as an alternative for organic and inorganic elimination from aqueous solution is adsorption process (Li et al. 2015). Many studies have been published and linked to CPX removal using natural materials as low-cost adsorbents (Elhussien et al. 2017; Roca Jalil et al. 2017). There are huge amounts of agricultural waste that are produced in daily bases, which led to environmental hazards. Subsequently, to solve the disposal problems from organic substances and heavy metal wastes, absorbent is effective to use. In this work, pomegranate peel was examined to replace the expensive adsorbents which are used to remove CPX. The effect of several circumstances such as contact time and concentration of CPX have been studied. Also, an attempt was made to the assessment of adsorption kinetics, adsorption potential using Langmuir, and Freundlich isotherms. Pomegranate peels collected from the juice market, washed and then dried by using oven at 110 °C for 1 day, then crushed and sieved to obtain particles with size 216 nm. Ciprofloxacin hydrochloride (CPX) with a purity above than 99.6% was bought from Riyadh pharma (Saudi Arabia). The empirical formula CPX is C17H18FN3O3HCl·H2O and its molecular weight is 367.8 g/mol (Fig. 1). Based on the molecular structure of CPX from Cambridge Structure Database (a) and its speciation at different PHs (Wang et al. 2011), a large fraction of CPX exists in the cationic form at pH within 4–5 due to the protonation of the amine group in the piperazine moiety. 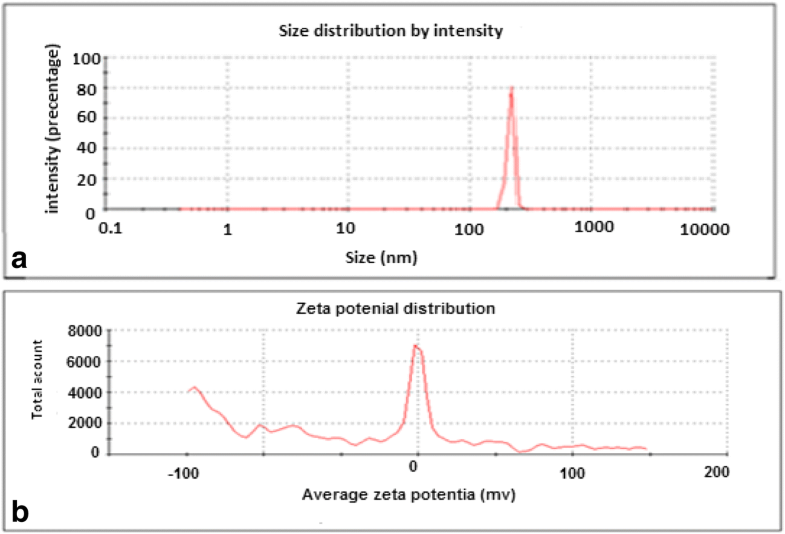 The zeta potential and particle size distribution of POP suspension were measured using a ZetasizerNano-ZS-90 (Malvern Instruments, Malvern, UK). The analysis was carried out at a scattering angle of 90° at 25 °C. For zeta potential measurements, 0.01 g of POP was dispersed in 100 mL double distilled water and calibrated in the automatic mode. 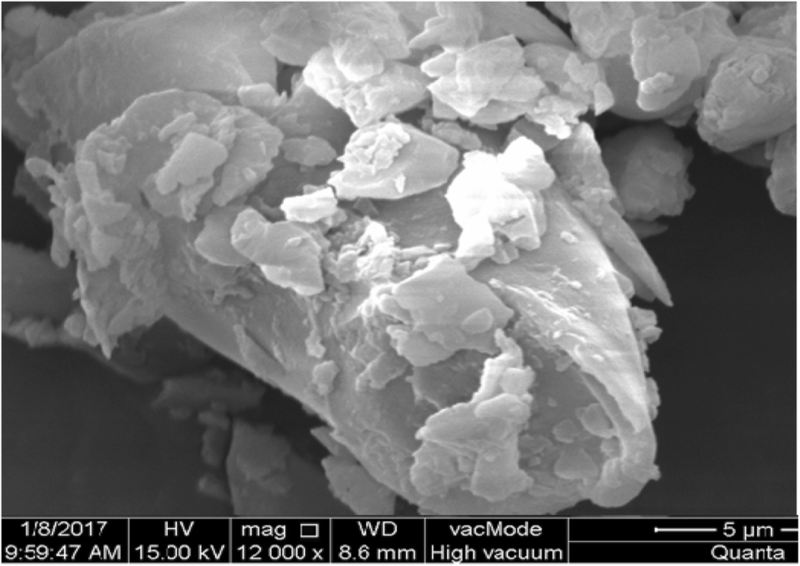 Scanning electron microscope (SEM) of POP sample was examined using QUANTA250 (Czech Republic) with accelerating voltage 0.5 to 30 kV, elevated resolution of 1.0 nm, and magnification × 5 to 500,000. FT-IR System, Spectrum BX, PerkinElmer, UK, was using to recognize the functional groups that are available for CPX adsorption on the adsorbent surfaces. In a volumetric flask, a stock solution of 1000 mg/L was getting ready by dissolving suitable amount of (CPX) in 1000 mL double distilled water, using the stock solution, different concentrations were made by diluting to the initial concentrations ranging from 50 to 300 mg/L. By UV/visible Spectrophotometer the Spectra of ciprofloxacin obtained, the absorbance of each standard solution (50, 100, 150, 200, 250, and 300 mg/L) was measured by a UV-Vis spectrophotometer (Ultrospec 2100 pro), Amersham Biosciences (England) at a wavelength of 274 nm. In order to reach the optimal concentration of CPX and POP, some experiments were performed with the suitable equilibrium time. The use of lower concentration of CPX (10–1000 mg/L) caused the adsorption process to be very quick and is totally adsorbed by 0.1 g of POP making it difficult to measure the remaining concentration after adsorption. Therefore, a small amount of POP (0.01 g) and a high concentration of CPX were taken between 100 and 10,000 to make it easier to follow up and measure the concentration of the drug after adsorption process. 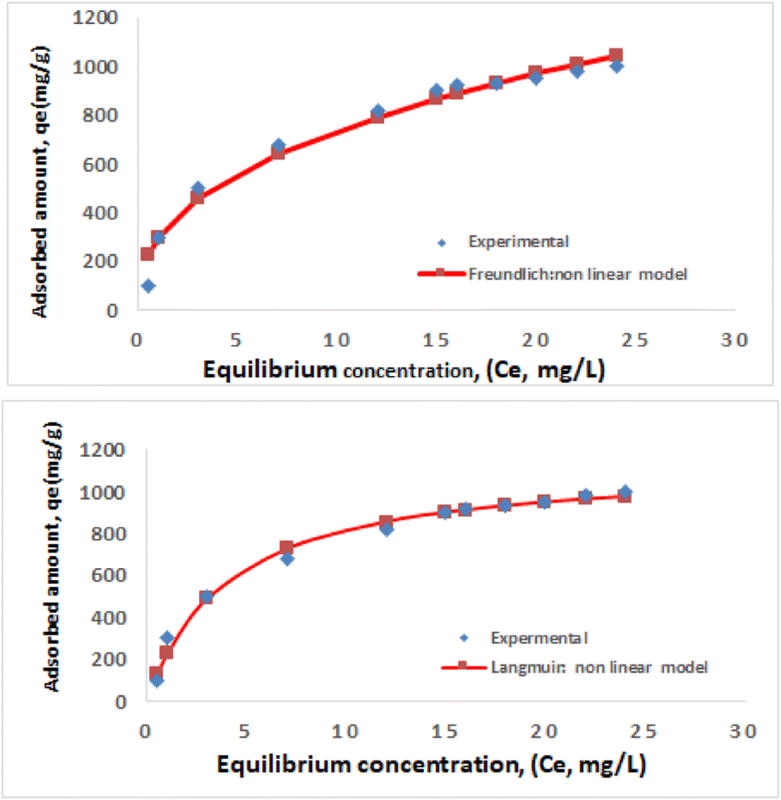 Batch adsorption experiments were applied, by dispersing 0.01 g of the POP with 10 mL of CPX solution in a 50 mL centrifuge tube at desired concentration (100–10,000 mg/L) at 25 °C, pH of 4–5 (pH of water) and shaken at 150 rpm for 2 h (100 r/min) and then centrifuged. The adsorption kinetics was determined at two initial CPX concentration Ci = 5000 and 10,000 mg/L. At various time intervals, 10 mL of supernatant was withdrawn for analysis. Kinetic experiments show that the equilibrium was reached in 30 min; hence, 2-h contact time was chosen in the further experiment to make sure that equilibrium was obtained. Using UV spectrophotometer, the CPX concentration of the supernatant was calculated at a corresponding wavelength (λ) of 273 nm. All experiments have been carried out at least twice and then the adsorption amount was calculated. To prevent the photo degradation of CPX, the whole tubes of the adsorption experiment were kept in a dark place. Where Ci and Ce are the initial and equilibrium concentration (mg/L) of CPX, m is the mass of the POP (g) and V is volume of solution (L). The zeta potential and size distribution are the main characteristic parameters for adsorbents material. The zeta potential and particle size distribution of the POP suspension are measured at natural pH (pH = 4–5). Figure 2a and b show the histogram of particle size distribution and zeta potential of POP respectively. The particle size of POP had a mean diameter of 215.7 nm with a narrow size distribution (width: 12 nm; polydispersity index: 0.961). The zeta potential of POP suspension was − 11.7 mV (Fig. 2b) indicating that POP particles have negative charge at natural pH. Thus, it can be concluded that POP are more likely to be used for the adsorption of cationic than anionic pollution. Figure 3 shows the SEM images of POP, which declared the heterogeneous rough and porous surfaces as well as the combination of small and large particles size, with a lot of cavities micro-rough texture. From SEM image the pores showed is having diameter in micrometer (μm) range. The micro-rough texture surfaces help in the adsorption and adherence of CPX on the adsorbent surfaces. 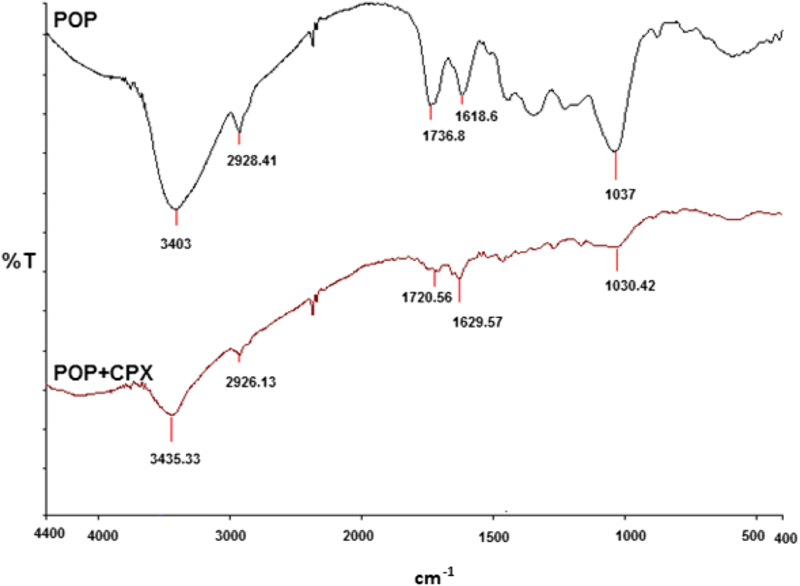 FTIR spectroscopy analysis shows outstanding information on the nature of the functional groups present on the POP surface that are available for the adsorption of CPX, FTIR spectra of POP and POP after adsorption of CPX (POP/CPX) are shown in Fig. 4. FTIR spectrum of POP showed characteristic bands at 3403 cm−1, 2928.41 cm−1, 1736.8 cm−1, 1618.16 cm−1, and 1037.01 cm−1. The bands ranged at 3404 cm−1 were attributed to stretching vibrations of N–H amid hydroxyl groups. The bands at 2928.41 cm−1 were attributed to –C–H–stretching vibrations of methyl groups. Band at 1736.8 cm−1 can be referred to C=O stretching vibrations of carboxylic acid or ester. The band at 1618.16 cm−1 was attributed to COO– asymmetric vibration of ionic carboxylic groups. The strong band at 1036.8 cm−1 indicates the stretching of the many C–OH and C–O–C bonds (Stuart 2005). Therefore, POP are more likely to be used for the adsorption of cationic pollutants. The spectrum pattern of POP after adsorption (POP/CPX) occurred changes in the corresponding peak of POP in comparison before adsorption which caused by adsorption process. The characteristic bands of POP at 3403 cm−1, 2928.41 cm−1, 1736.8 cm−1, 1618.16 cm−1, and 1037.01 cm−1 shift to 3435.33, 2926.13, 1720.56, 1629.57, and 1030.42 cm−1 due to the adsorption of CPX on POP surface. In the recent years, adsorption mechanisms are explained by involving kinetic-based models which describe the reaction order of adsorption systems based on solution concentrations. In the present study, we used Lagergren pseudo-first-order kinetic model (Febrianto et al. 2009) and pseudo-second-order (Özacar and Şengil 2006; Tiwari et al. 2013). The kinetic parameters of CPX adsorption onto POP were determined using non-linear regression analysis. where qe and qt are the adsorbed amount of CPX at equilibrium and at time t respectively, kf (min) are rate constant of pseudo-first-order of adsorption of CPX onto POP respectively. The qe and kf (Table 1) were determined by non-linear fitting (qt vs. t). Pseudo-first-order kinetic model has been applied to many adsorption kinetic studies (Febrianto et al. 2009). where ks (g mg−1 min−1) is rate constant of pseudo-second-order of adsorption of CPX onto POP respectively, h is the initial rate (mg/g·min) of adsorption CPX at time t = 0. On the integration of Eqs. 2 and 3 with boundary conditions, qt varying from 0-qt when t varies from 0-t, gives non-linear form of pseudo-first and non-linear form of pseudo-second-order kinetic model (Ho and Chiang 2001) as shown in Table 1. Error functions are required to assess the kinetic model describing the experimental results in a best possible way. Therefore, three different error functions were employed, namely the sum of the squares of the errors (SSE), residual root mean square error (RMSE), and Chi-squares (χ2). where the subscripts (exp) and (cal) are the experimental and the calculated values of qe respectively and n is the number of measurements. For the best-fit kinetic model in any adsorption study, three conditions should be satisfied: (i) the qe·exp values should reasonably match with the qe·cal values at all initial concentrations of adsorbate, (ii) the values of R2 should be maximum, and (iii) the values of SSE, RMSE, and χ2 should be minimum. 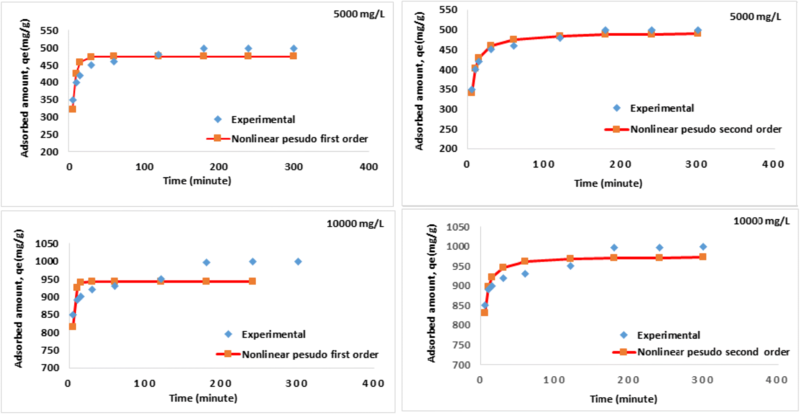 Figure 5 shows the experimental data and the predicted PFO and PSO kinetics of the adsorption of CPX on POP at low and high concentrations (5000 and 10,000 mg/L) using non-linear method. Table 2 presents the theoretically derived kinetic parameters with experimental equilibrium adsorption capacity of POP. Study of goodness of fit using error functions SSE, RMSE, and χ2 and R2 value are also presented in Table 2. Fitting of adsorption data to PFO and PSO (non-linear) kinetics of adsorption of CPX onto POP at two initial concentration, 5000 and 10,000 mg/L at 25 °C. It was observed that the adsorbed amount of CPX increases rapidly with the contact time up to 5 min and thereafter, the rate of adsorption becomes constant. This observation can be explained as follows, initially the adsorption sites of POP were vacant and the POP was rich with porosity (as shown previously from SEM result) and CPX interacted easily with the site and the concentration difference between the bulk solution and the solid liquid interface was initially higher; this lead to higher rate of adsorption observed through 5 min. Afterwards, CPX was accumulated in the large available surface of POP which lead to occupation of surface binding sites making adsorption to be slowed down. The time required to attain this state of equilibrium is termed the equilibrium time, and the adsorbed amount of CPX at the equilibrium time reflects the maximum adsorption capacity of the adsorbent under those operating conditions. A contact time of 2 h was fixed for further experiments. Table 2 reveals that the non-linear plots of pseudo-second-order model gave much lower SSE, RMSE, and χ2 with much higher correlation coefficients, R2 for initial concentration of 5000 and 10,000 mg/L of CPX respectively than those find by of pseudo-first-order model. In addition to above, the qe(exp) values increased with increasing the time and initial CPX concentration and qe(cal) values should also follow the similar trend. Also the result showed that the calculated adsorbed amount of CPX qe(cal) by the pseudo-first-order model differs greatly from those measured experimentally qe(exp), while these obtained from the pseudo-second-order kinetic model are very close to the experimental adsorbed amount. According to the results of pseudo-second-order models, the initial adsorption rate (h) increased with increasing the concentration. Finally, considering both q(exp), q(cal), and error functions (SSE, RMSE, χ2, and R2) together, it is concluded that the best-fit kinetic model to explain adsorption of CPX onto POP is a non-linear form of pseudo-second-order kinetic model more than with the pseudo-first-order. The agreements of the experimental data with the non-linear pseudo-second-order kinetic model indicate that the mechanism of CPX adsorption on POP surfaces might be chemical adsorption involving valence forces through sharing or exchange electrons between POP and CPX. where Ce is the concentration of phosphate solution at equilibrium (mg P/L), qe is the corresponding adsorption capacity (mg P/g), and qm (mg P/g) and KL (L/mg) are constants which are related to adsorption capacity and energy or net enthalpy of adsorption, respectively. where Kf and n are the constants, which measure the adsorption capacity and intensity, respectively. Non-linear regression can be a powerful alternative to linear regression because it offers the most flexible curve fitting functionality. For non-linear model, sum of squares error (SSE), residual root mean square error (RMSE), and Chi-squares (χ2) must be minimized by an iterative method. The non-linear regression line is the line that minimizes the sum of squared deviations of prediction. This parameter measures the accuracy of predictions. The smaller the standard error of the estimate indicates the more accurate prediction. Figure 6 shows Langmuir and Freundlich adsorption isotherms of POP by non-linear analysis; Table 3 shows the values of corresponding isotherm parameters, their correlation coefficients (R2), and related standard errors (SSE, RMSE, and χ2). In Table 3 and Fig. 6, high R2 are derived by fitting experimental data into the Langmuir isotherm model (R2 > 0.987), as compared with the Freundlich isotherm model (R2 > 0.86). Meanwhile, the values of three different error functions (SSE, RMSE, and χ2) each parameter obtained in Langmuir isotherm model are correspondingly lower than that of the Freundlich isotherm model. These suggest that Langmuir isotherm model can generate a satisfactory fit to the experimental data of adsorption of CPX onto POP, while Freundlich isotherm model cannot. As shown, the value of maximum adsorption capacity determined using Langmuir model (qm)calc was 1135 mg/g. These values are near the experimental adsorbed amounts and correspond closely to the adsorption isotherm plateau (999 mg/g), which indicates that the modeling of Langmuir for the adsorption system is acceptable. Moreover, the adsorption feature of the experimental system might be caused by the monolayer adsorption. Depending on Langmuir isotherm, the low RL value (0.0004), thus, indicating ‘favorable adsorption’ and strong binding between the CPX and the POP. Adsorption capacities of CPX from the present study were compared with other adsorbents in previous studies (Akhtar et al. 2016; Carabineiro et al. 2012; Elhussien et al. 2017; Genç and Dogan 2015; Genç et al. 2013; Gu and Karthikeyan 2005; Peng et al. 2015; Rakshit et al. 2013) (Table 4). The very high value of adsorbed amount of CPX on POP probably reflecting the higher content of function group on POP surface such as OH and NH as indicated previously from FTIR spectrum. These function groups on POP surface gave them the superlative ability to bind strongly with function group pf CPX. Depending on the molecular structure of CPX from Cambridge Structure Database (a) and its speciation at different pHs (Wang et al. 2011), in this study, the equilibrium solution pH was within 4–5 (where a large fraction of CPX exists in the cationic form due to the protonation of the amine group in the piperazine moiety. At the same time, the zeta potential of POP is − 11.7 mv (Fig. 2b) indicating that POP surface has negative charge. The difference in the charge increases the chance of adsorption of CPX on pop surface through strong electrostatic attraction between negative charge on POP and positive charge of CPX. The adsorption studies of CPX on POP through the kinetic and equilibrium modeling have been investigated by non-linear regression methods. The sorption of CPX on POP was found to be well represented by the non-linear pseudo-second-order kinetic model with suitable practical and calculated values of qe. The adsorption isotherm of CPX on POP was fitted to isotherm models by non-linear regression. The results showed that the Langmuir model could fit the data better than the Freundlich and the determined parameters were acceptable. The values of maximum adsorption capacity estimated from Langmuir model (qm) exhibit a superior CPX adsorption capacity (1135 mg/g) than that of several other adsorbents in literatures.